I love a walk in the country, but a walk that's all about The Walking Dead, and with a few Saviors...that, my friends, is totally awesome! 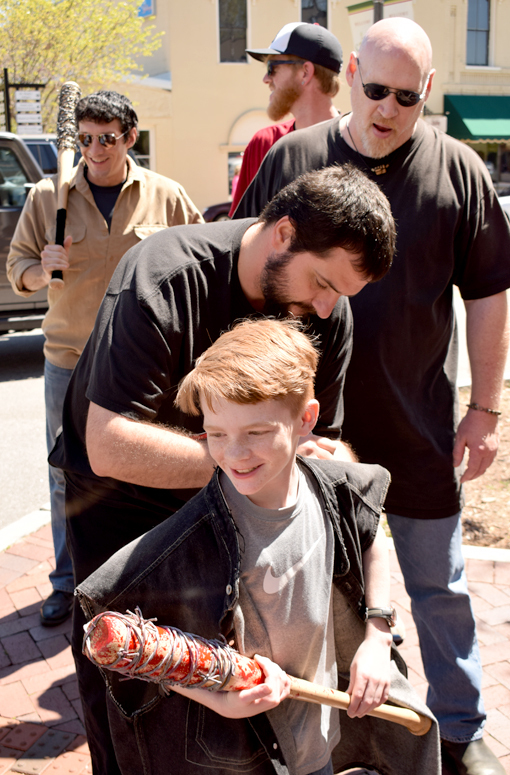 Atlanta Movie Tours' Big Zombie Walking Tour is a must-do for every fan of The Walking Dead. And it's walking, not running...at least not until the zombie apocalypse. One of the perks of going on an Atlanta Movie Tours tour is that you get a keepsake digital photo made at one of the filming sites for the particular tour you're on. My friend Malika Bowling (yellow shirt on the left) was on the tour the same day I went. Check out her food and travel blog, Roamilicious! 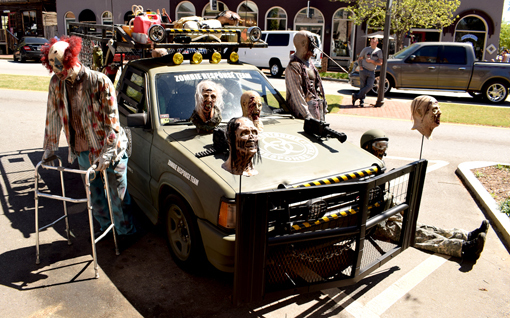 On the day I went on the Big Zombie Walking Tour, there were a few other "visitors". The best was the Daryl Dixon cosplayer! He was making photos with everyone and hit the bulls-eye on Daryl's personality. This tour starts at The Walking Dead Cafe in Senoia, a great place for lunch or to enjoy a beverage. They have some nifty souvenirs, too! I highly recommend making your way to The Walking Dead Cafe via the Woodbury Shoppe. There are stairs at the back of the store—which has approximately a bazillion The Walking Dead souvenirs and collectibles—that take you to a totally awesome mini museum, with multiple photo-ops. 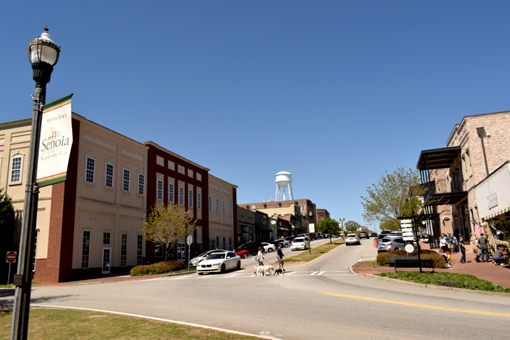 Except for a few tell-tale signs—like The Walking Dead Cafe and Nick & Norman's (which is where I had lunch after the walking tour)—you wouldn't know that this charming Southern town, established in 1866, is Woodbury from The Walking Dead. If you've never been on a film sites tour, it's difficult to explain how cool it is to be "in" a scene or "in" a television show or movie. It's pretty awesome, I can tell you that much. The mind wanders and wonders while you're there. Just wait until you see how many "What if..." scenarios play out in your mind as you find yourself "in" The Walking Dead! I was blown away by the number of filming sites there are in such a small radius of downtown Senoia. 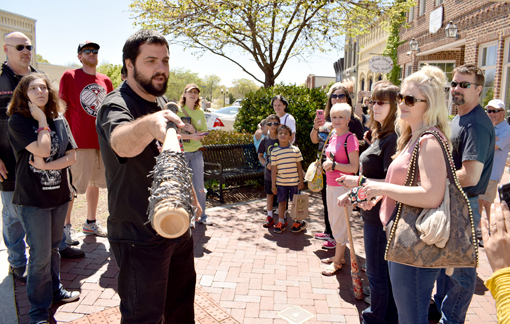 This tour is an information-packed hour, so listen up so that you don't miss any of the coolness that your Atlanta Movie Tours Insider is sharing with you! 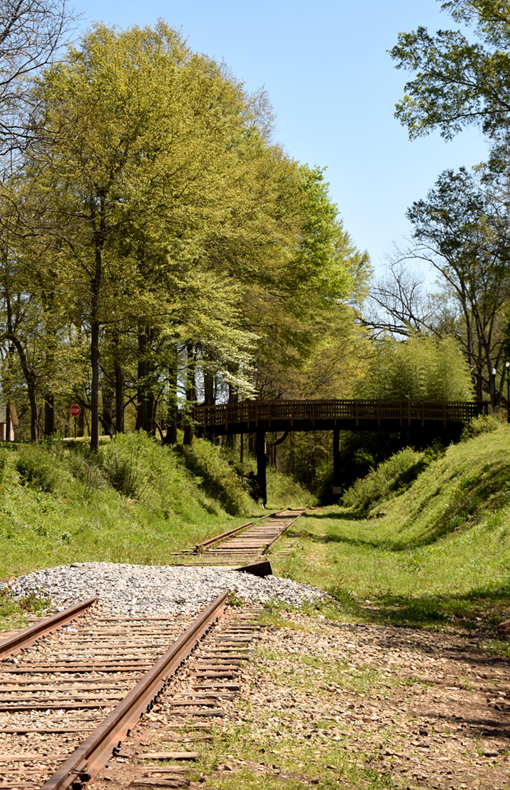 I encourage you to explore Senoia before or after your tour...there's lots to see and do in a day, a weekend, or an extended stay. After lunch a Nick & Norman's, I visited the Senoia Visitors Center at 68 Main Street, a few doors down from Woodbury Shoppe, and picked up a few brochures. The lovely lady there that day told me about the Senoia Historical Society & History Museum. Only a few blocks away, I made my way there and discovered 150+ years of fascinating history! I'll write more about that experience soon, but do go check it out yourself. Film and television have iconic scenes that permeate pop culture, like when Darth Vader told Luke who his father really is; and how electrifying the final scenes were in Jaws; and, of course, Carl Grimes eating 112 oz. of chocolate pudding...rooftop! 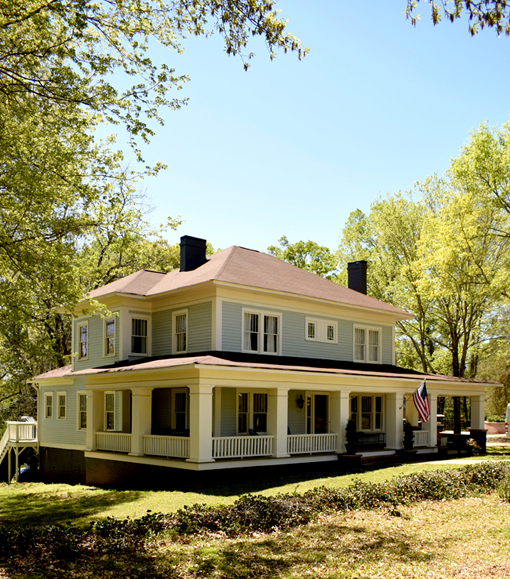 On this tour, you get to see the Chocolate Pudding House from that iconic scene! If you're a die-hard fan of The Walking Dead, I highly recommend that you go on this tour as soon as possible. As in the show, sites on this tour change. 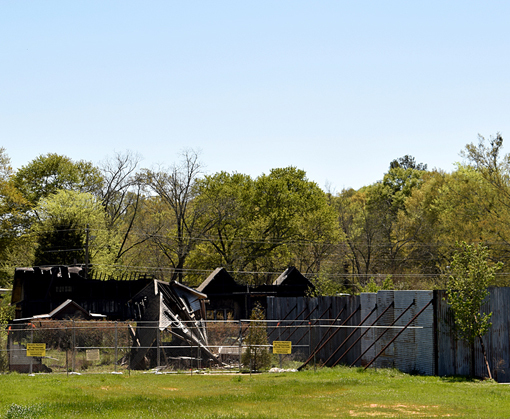 In the photo above you see the remains of what was the Church Tower in the Alexandria Safe Zone. At the conclusion of our tour, in Negan-style, one of the Saviors conducted an "Eeny, meeny, miny, moe" selection, Lucille (a reproduction, of course) pointed at most of us tourists at some point in this dialogue...at me in the photo above! What was about to happen??? The young man pictured above WON!!! 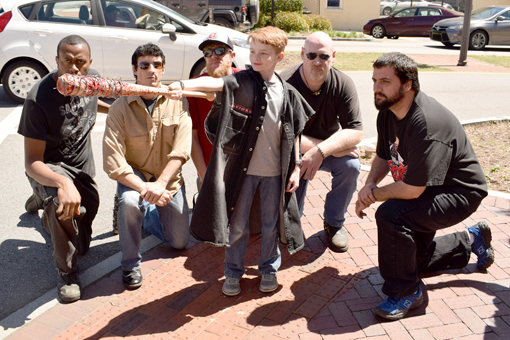 He won a Savior denim jacket, which all the Savior cosplayers autographed for him! How cool is that! He was soooooo excited! This was a special tour. I don't think they're eeny-meenie-miny-moe'ing Savior jackets on every tour, but I've been made to feel special on every Atlanta Movie Tours excursion I've been on and I think you'll feel pretty special too exploring Woodbury and other filming sites of The Walking Dead. 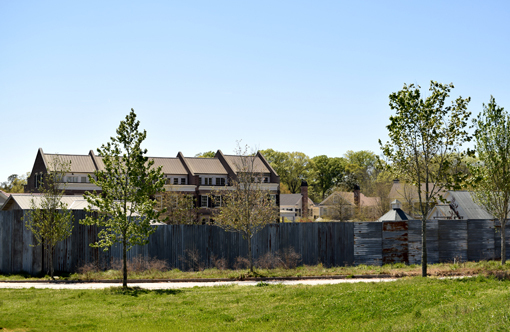 Did you know that the Alexandria Safe Zone is also the home to pre-zombie apocalypse people? It's true...there are a few lucky people who actually live there now. I believe that when filming here is complete that "Alexandria" will become a residential area, literally at the edge of town in Senoia. 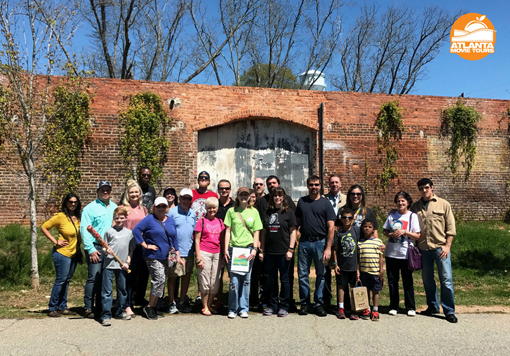 I don't know how long "Alexandria" will continue to be a set for The Walking Dead, and being one of the sites on this tour that won't be there forever, at least the wall, now is a good time to get in on the Big Zombie Walking Tour!